What light do plants need and how can we choose a good lamp? Discussion in 'Planted Tank Equipment' started by tyronegenade, Jun 16, 2014. Light doesn’t only drive photosynthesis. Changes in the quantities of certain colors of light serve as signals to the plant to grow or stop growing; to flower or not to ripen fruit. The molecules that sense or harvest the light are called photopigments because they have color. We are most familiar with chlorophyll, beta-carotene and anthrocyanins (that color plants red and purple). In addition to these there are Phytochromes, Cryptochromes and Phototropins that are the “eyes” of the plant by which it can “see” what it has to do. What we refer to as blue light in the hobby is actually three colors: blue and violet. If I refer to blue light below I am referring to light of approximately 455–492 nm. Another important concept is that different colors of light are associated with different quantities of energy. Violet photons (particles of light) carry more energy than red photons. What this means is that a red lamp of 1 W will produce more photons than a blue lamps of 1 W. Plants aren’t sensitive to the energy of the photons when it comes to photosynthesis. For them what matters if the number of photons that they can absorb; but for us who want to provide our plants with the most useful photons the color and energy of the photons of that color is important. But what wavelengths are needed for photosynthesis? 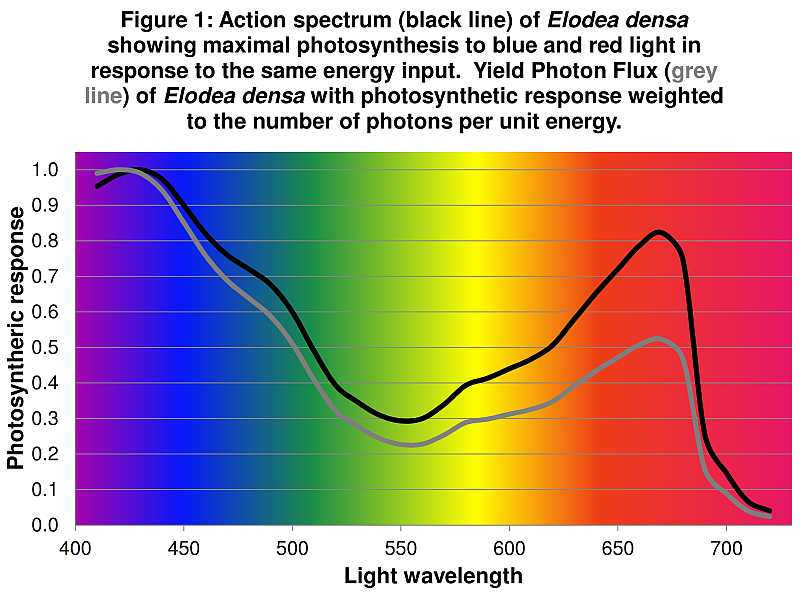 The classic Elodea action spectra (hence forth: ELAS) is given in Figure 1 and shows that, Watt per Watt of energy, which light colors stimulate photosynthesis the most efficiently . These are the violet (400-450 nm) and the orange-red (620-680 nm) wavelengths. As a consequence the ELAS in Figure 1 has to be modified to account for the number of photons per unit energy. This is shown in Figure 1 with the line labeled Photon Yield Flux (hence forth ELPYF) which is the expression of the ELAS in terms of photosynthetic efficiency per photon. Elodea is almost half as sensitive to red light compared to blue light. Let us now consider the molecules that are absorbing the light. The chlorophyll a and b molecules are the principal molecules that harvest photons of light and, in a protein complex called a photosystem, turn the energy of those photons into energy to fix carbon dioxide as sugars, ATP and NADPH (the two energy carriers involved). A third photopigment, beta-carotene, can also harvest photons and transfer the energy to the photosystems but its effectiveness at transferring the energy to the photosystems is poor (ranging from 8 to 31%) [2-3]. It has a negligible role in plant photosynthesis. Its primary role is an anti-oxidant in the photosystem that can absorb high energy blue/violet/UV photons that might damage the chlorophyll pigments. Chlorophyll a, b and beta-carotene are present in plants at stable ratios of 2:1:1 [4-9]. This ratio does not change in response to light conditions . There is no reason to believe that aquarium plants can adapt to use yellow and green light. That plant can perform photosynthesis with yellow light is true, but you would need three times as much yellow light as you would violet light. On the other hand, the action spectra of algae peak in the yellow range so providing lots of yellow light favors algae (http://www.life.illinois.edu/govindjee/photosynBook/Chapter11.pdf) . The beta-carotene that is oxidized bay violet and ultraviolet light plays an important role in plant physiology. It is used by two proteins, Cryptochrome and Phototropin, to sense changes in light intensity so the plant can respond to it appropriately. They initiate stomatal opening, cell elongation (plant growth), the production of new chloroplasts as well as anthrocyanin production. Cryptochrome and Phototropin have a broad action spectrum spanning 350 to 500 nm (peaking at 430 nm). The action of Cryptochrome requires simultaneous stimulation of Phytochrome. Phytochrome has several physiological roles distinct to that of Cryptochrome. These are stem elongation and the initiation of flowering and germination as well as the ripening of fruit (where they control anthrocyanin production). Phytochrome activation requires a high red (650-700 nm) to far red (700+ nm) photon ratio. In the presence of red light Phytochrome is switched on, and in the presence of far red light it is switched off. Phytochrome has an action spectrum peak at 730 and 660 nm . However, in green (and red) leaved plants with high concentrations of chlorophyll the plant’s Phytochrome molecules are most sensitive to light of 628 nm . For plants to grow they need adequate stimulation of Cryptochrome, Phototropin and Phytochrome and that means supplying light in the UV-Violet range (380-430 nm) and orange range (620-630 nm). 400-450 nm (blue-violet light) and 650-700 nm (orange-red light) to determine which lamps possess the most photosynthetically stimulating light. The ELPYF was used to convert the lamp spectra into the number of effective photons per Watt. As a lamp with mostly yellow light can still have a high ELPYF the amount of red + blue photons in the above ranges were added up to determine the lamps with the most light that is useful to plants. What is important to keep in mind is that Elodea is an obligate aquatic plant while many aquarium plants, such as amazon swords, are facultative aquatic plants that can survive out of water in boggy soil. In fact, the latter is their preferred habitat. Whether they have an action spectra such as that of Elodea or of terrestrial plants that display more sensitivity to red light is unknown at this time (if anyone has action spectrum data of an facultative aquatic plant please let me know!). The chlorophyll/beta-carotene ratios [2-10] are unhelpful as the plant can modify the absorption spectrum of the pigments in the photosystems to adapt to light input in the red and blue ranges. The stable ratios can be misleading. Still, and importantly, there is no evidence that green plants can adapt to yellow light for photosynthesis and grow well. They need the blue and red light. 380-430 nm (violet light) and 620-630 nm (orange) light was used to estimate Cryptochrome/Phototropin and Phytochrome stimulation. Whether there is a minimum and maximum value, over which no additional photon flux will increase growth, is not known at this time. As a consequence our analytical scheme is not sensitive to this issue and could give some lamps a higher rating than they deserve. All the lamps in question produce several times less far red light than red light so the inhibition of Phytochrome is negligible. I defer to Greystoke to present and explain his Excel spreadsheet and how he did the math… I must be explicit here: we do not claim to know which is THE best lamp, only to have some idea of what makes the best LAMPS for growing aquarium plants. Our ranking may not reflect reality 100%. To determine which is THE best lamp would require experimentation. 1. Data extracted from Figure 8.8 of Life, Science of Biology by William K. Purves, David Sadava, Gordon H. Orians, H. Craig Heller (6th Edition) Sinaur. If anyone has the original reference (and the original data) please let me know! 2. Faller, Peter, Andy Pascal, and A. William Rutherford. "β-Carotene redox reactions in photosystem II: electron transfer pathway." Biochemistry 40.21 (2001): 6431-6440. 3. Telfer, Alison. "What is β–carotene doing in the photosystem II reaction centre?." Philosophical Transactions of the Royal Society of London. Series B: Biological Sciences 357.1426 (2002): 1431-1440. 4. Shukla, O. P., S. Dubey, and U. N. Rai. "Preferential accumulation of cadmium and chromium: toxicity in Bacopa monnieri L. under mixed metal treatments." Bulletin of environmental contamination and toxicology 78.3 (2007): 252-257. 5. Vajpayee, P., et al. "Chromium-induced physiologic changes in Vallisneria spiralis L. and its role in phytoremediation of tannery effluent." Bulletin of environmental contamination and toxicology 67.2 (2001): 246-256. 6. Sivaci, Aysel, et al. "Removal of cadmium by Myriophyllum heterophyllum Michx. and Potamogeton crispus L. and its effect on pigments and total phenolic compounds." Archives of environmental contamination and toxicology 54.4 (2008): 612-618. 7. Maleva, Maria G., et al. "Ecophysiological tolerance ofElodea canadensis to nickel exposure." Chemosphere 77.3 (2009): 392-398. 8. Lafabrie, C., et al. "Comparison of morphology and photo-physiology with metal/metalloid contamination inVallisneria neotropicalis." Journal of hazardous materials 191.1 (2011): 356-365. 9. Hussner, Andreas, Deborah Hofstra, and Peter Jahns. "Diurnal courses of net photosynthesis and photosystem II quantum efficiency of submergedLagarosiphon majorunder natural light conditions." Flora-Morphology, Distribution, Functional Ecology of Plants 206.10 (2011): 904-909. 10. Voeste, D., Levine, L. H., Levine, H. G., & Blüm, V. (2003). Pigment composition and concentrations within the plant (Ceratophyllum demersum) component of the STS-89 CEBAS Mini-Module spaceflight experiment. Advances in Space Research, 31(1), 211-214. 11. Rabinowitch, Eugene. "Photosynthesis." Annual Review of Physical Chemistry 2.1 (1951): 361-382. 13. Jose, A. M., and E. Schäfer. "Distorted phytochrome action spectra in green plants." Planta 138.1 (1978): 25-28. Sidney J, Clare, Jacobus Roux and 3 others like this. Good writeup and very good to know thanks guys. That is actually halt of my story. It's all I managed to upload while my server was having all sorts of "hick-ups". The full story follows below and I'm asking the mods to (please) delete my previous post. This has been in the pipe line for a long time. Unfortunate, I never had much to report, so – perhaps – I could be excused for making people wait for this so long provided – of course – that this time I have something worthwhile, and indeed I have. A number of years ago I started collecting the spectra of fluorescent light tubes as they became available on the internet. That wasn’t so easy in those days. I collected them as JPEG pictures, some of which were no larger then a postal stamp. It took weeks before I finally had about six decent ones. Next there was the problem of digitizing these graphs, mostly by superimposing a grid over the picture, converting the scales and then measuring the X and Y coordinates. I took me days to do this, so it didn’t take long before I invested in topnotch picture editing software to speed things up a bit. Anyway, today, with all the software available, things are a lot easier. Now I have 70 spectra – fully analyzed – on record. But the reason why I wanted these spectra was that I wished to find out why some lights are better for plant growth than others, i.e. : what is it in their spectrum that makes them different. Not that I knew what to look for in a spectrum. At first I didn’t have a clue, but I’m good in mathematics and I thought that mathematical correlation of the spectra of “good” lights against the spectra of “bad” lights will tell me the difference between “good” and “bad”, so to speak. However, I battled for months and months, but no matter what I tried, it wasn’t to be. Eventually I convinced myself that I needed to know what plants require in a light source. Unfortunately, what I know about plants is shockingly dangerous, so when one day Tyrone Genade joined the discussions I was more then willing to explain my findings together with my predicament to a person, who – I understand - is actually an assistant professor in plant physiology living in sunny Orange City, Iowa, USA. Tyrone explained that I should measure the spectrum emissions of fluorescent lights in certain bands of wavelengths and then list them in order of the results. That said and done, we soon got some very exciting results, which – eventually – brought us where we are today. Today, we can rate aquarium lights in order of plant growing potential, with a fair amount of reliability. It’s still not perfect, because the ratings are based on average responses, which can occasionally hide an underperformance. Remember that you fail an exam if you fail a single subject, even if you still have a reasonable average. Of course, we don’t have pass rates for our criteria (yet), which is why some lights maybe in an inflated position. The key to find the important parameters of a light bulb is its efficiency of converting electrical power into light and the components of its radiated light spectrum. The spectrum displays the distribution of the light emission over its range of colors (wavelengths), usually from 400 to 700nm (300 to 800nm in this exercise). The spectra differ widely among the various types of light sources. Some published spectra have very good spectral resolution, but most show "less than accurate" features. In tri-phosphor fluorescent bulbs most of the energy is emitted in narrow wavelength regions, and if these regions are not well sampled, the lumen and PAR output can show significant errors. In fact, some manufacturer's data show irregularities that are difficult to reconcile. To overcome this problem attention is given to aspects of the process that is considered to be inherently more reliable. It is argued that - for instance - the fluorescent tube's efficiency is governed by a physical process which does not vary significantly between manufacturers. Consequently, the achieved results should be common to all the known makes. where "P" is the electrical input power in Watt used to generate ALL the light, which (hopefully) equals the actual power consumption or - in its absence - the rated power. "VC" represents the Visible Content [%] of the total light emission of the lamp. (see: "The Efficiency Estimate" worksheet as evidence of the very wide variations in the manufacturer's provided information). That doesn't mean that the data is more (or less) accurate than the published information, it does - however - show a more consistent relationship between different manufacturers, which overcomes the complications of: under- or over rating, or - worse - no information at all. However - when provided - the manufacturer's luminous output information is included. All spectra are manually digitized, but no responsibility can be accepted for errors that may occur as a result their application. They have been digitized with all the best intentions and skills, although some had to be re-constructed to match the scale of the spectrum. Anyway: Please understand that you use these spectra at your own risk. Lumen is an indication of the visible light output of the lamp. Levels vary from ≈30 to ≈95 Lumen per watt. The value can be measured with a Lux-meter, or it can be calculated. (Simple Lux-meters can be easily made. There are LDR's (Light Dependent Resistors) that have a close spectral sensitivity similar to the human eye and which are actually rated in lux (Lumen/m²). All you need to do is hook-up one to a multi-meter and measure the resistance. A calculator will do the rest. To calculate the Lumen output we need the efficiency "η" in % and the spectrum and multiply it with the unitized Standard Eye Curve (see worksheet: "Photopic Luminous function"). This will result in a modified spectrum of the visible light components rated to the sensitivity of a "standard" human eye. This spectrum needs to be integrated over the visible range of 400 to 700nm and expressed as a proportion (%) of the original spectrum, called the "Visible Content" (VC). Lumen = Input Power[W] x VC[%] x η[%] x 683[Lm/W]. For some tubes the manufacturer provides both initial (minimum) and design lumen specs, but most tubes are listed with just a single lumen rating, which in most cases is assumed to be initial lumens. However, in cases of profound under-ratings the published numbers are likely to be design levels related to an average over the life-time of the tube. But one can never be certain, and comparisons are only accurate if a consistent lumen parameter is used. The results are also dependent on the assumption that the tubes' published power consumptions (Watt) are the actual Watt levels drawn by the tubes, and not nominal values. Photo synthetically Active Radiation, often abbreviated: PAR, represents the spectral range of radiation from 400 to 700 nanometers that photosynthetic organisms are able to use in the process of photosynthesis (ex: Wikipedia). then integrate the modified spectrum over the 400 to 700 nm range. The first ten rows in each spectrum worksheet are hidden because the formulas are sensitive to accidental button-pushing. You can specify the limits of four color bands and view the responses in the summery sheets of the fluorescent lights, metal halides and LEDs in PAR per Watt of output light. Slasher, dart and Hanekka like this. I’m having some grief opening the Excel file that Greystoke posted (my excel claims it is corrupt), but what I have been able to recover, it looks like an earlier version of the file Greystoke shared with me for discussion. So, here are the interesting bits from the analysis. 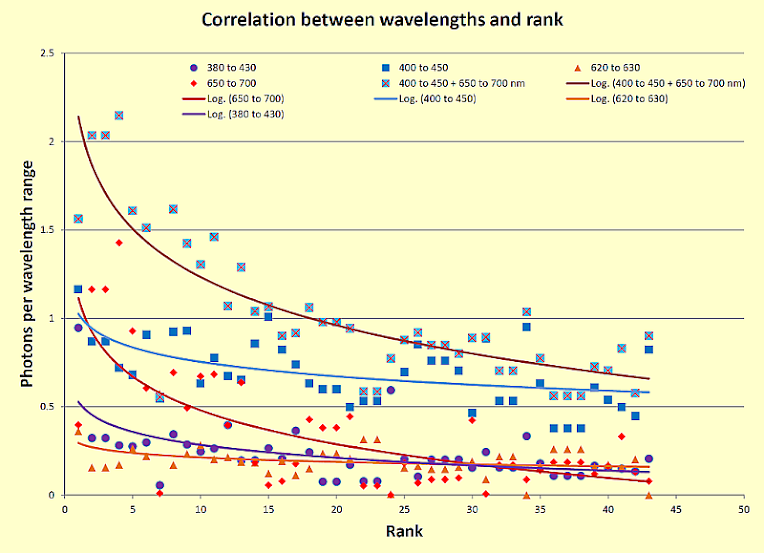 So, is there a correlation between our ranking system and the light wavelengths we chose to examine? Firstly, all the plant lamps are in the top ranking. This is good news: it means we have reasoned correctly (or close to correctly) what the manufacturers were reasoning when they designed the lamps. That aquarists agree that these lamps give superior results to other lamps suggest we may have an accurate analysis of what makes a good planted aquarium lamp. 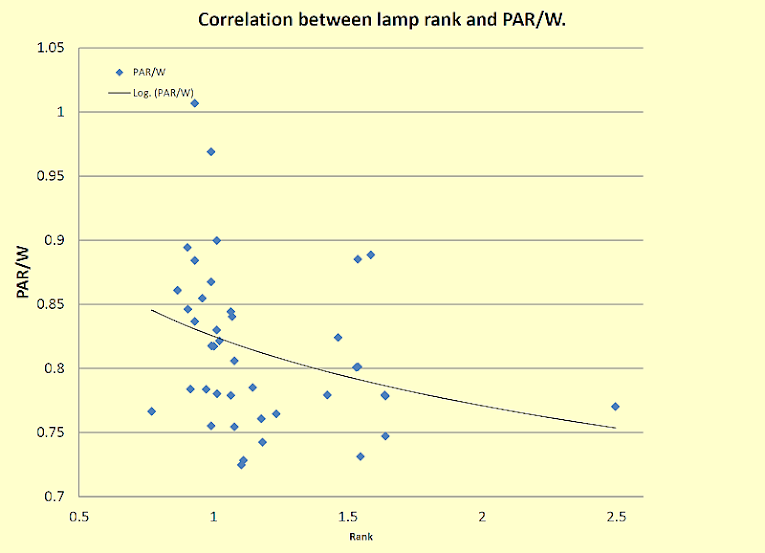 There is a strong correlation between the amount of 400-450 (r = 0.519, P = 0.000401*) and 650-700 nm (r = 0.536, P = 0.000242) light and the ranking system. (FYI: The Spearman Correlation coefficient model was used to calculate correlations as it is designed for using rankings. Your standard Excel does not come with this option. It uses a different model.) This correlation is stronger when these wavelengths are added up (r = 0.763, P = 0.0000002). The correlation between 380-430 nm light and the rank is strong (r = 0.514, P = 0.000465) while that of the 620-630 nm light is weak (r = 0.248, P = 0.108). The warm whites have the lowest values for the 620-630 nm range but do grow plants. This suggests that there is a minimum 620-630 requirement of the plants which, once supplied, makes little difference how much more is given. It probably has no effect on what makes a good planted aquarium lamp. In addition, Phytochrome can be stimulated by violet light and other red/orange wavelengths. * The P-value is a measure of how seriously we can take the conclusion. The higher the P-value the more unlikely it is that we are seeing something by chance. P-values less than 0.05 are considered to be significant; i.e. the numbers (in this case a correlation coefficient) can be taken seriously. From the data is seems the most important criteria is how much light there is in the 400-450 and 650-700 nm wavelengths and that the amount of UV/Violet light emitted by the lamp is also important. This has been confirmed experimentally . Now some may say “well, duh! You ranked all the lamps by these criteria, of course there will be a correlation.” This is a legitimate objection. However, if we had chosen our criteria incorrectly, we would not see a correlation at all. These criteria were also selected based on what we thought the plants needed, not on what we thought manufacturers wanted in a good plant lamp. In addition, our ranking conforms to the expectation that cool and warm whites would rank low and the plant lamps would rank higher. Adding validity to your analysis is the discovery that the 620-630 nm wavelengths probably don’t matter—that is we haven’t rigged the model to give us the answers we want. 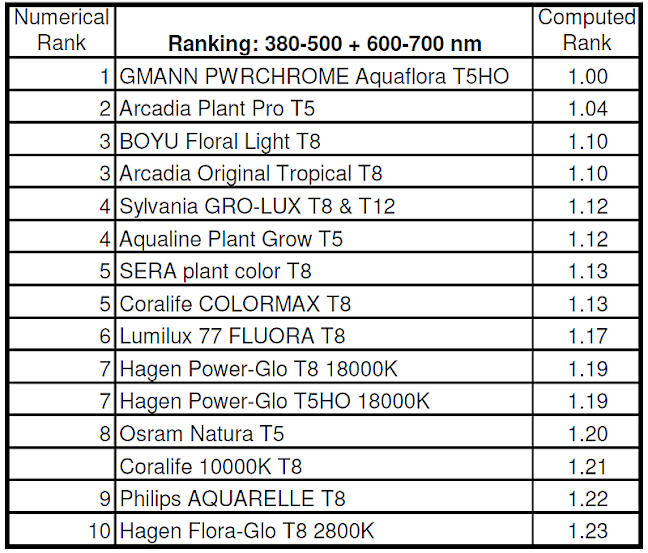 If the 620-630 nm range is omitted from the analysis the identity of the top 10 lamps doesn’t change by much (the Osram Natura dropped to number 11 and the Sylvania 865 jumps to number 8, see ranking below). The order is largely the same. The total photons were added up and then the totals normalized to the highest value (the Gro-lux lamp). In this ranking the Gro-lux rockets to the top of the ranking and the Aquaflora drops to number 3. What is very important to see here is that the Gro-lux has twice as many photons as the Aquarelle that can maximally stimulate photosynthesis as. You would need three cool whites and almost four warm whites to achieve the plant growing power of a Gro-lux lamp. Here again, the plant lamps are at the top but the difference between them is less. Noticeably, the Hagen Aqua-Glo and GE 9325K drops from the top 10.The problem with this ranking is that it doesn’t correlate with experience. In the above ranking the Osram Skywhite and Daylight lamps would rank lower than cool and warm whites which is counter to the experience of aquarists. The rankings that are confined to the wavelengths that maximally stimulate photosynthesis give a ranking that is much closer to the experience of aquarists. 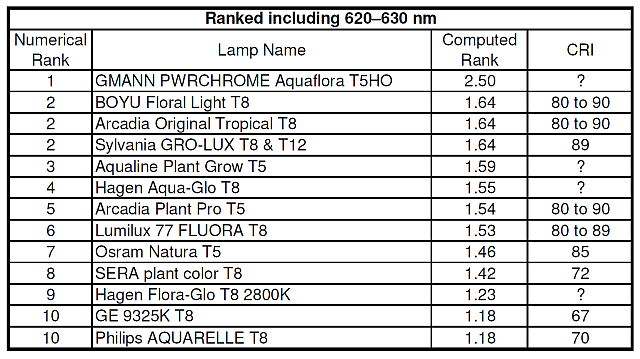 Which ever ranking is adopted, it is safe to say that we can make a good guess of which are the top 10 lamps for growing aquarium plants. That is the good news. When it comes to PARmeters, they measure all photons irregardless of how much they stimulate photosynthesis. A PARmeter will measure 200 micromoles of 550 nm light much the same as it was 200 micromoles of 660 nm light. The graph suggests that there is an energy cost involved in producing lamps with high red + blue spectra as opposed to lamps with a high yellow/green spectrum. In part this is because more energy is needed to produce blue photons over red photons. A violet photon has 1.7x as much energy as a 660 nm photon. If the inferior lamps average out with high PAR/W it is largely because they produce very little violet light. Spectral composition is far more important than how many PPFD the lamp emits. The large difference in optimum photons emitted per lamp also suggests that not only will certain lamps give superior growth, but that if superior lamps are chosen over inferior lamps less energy would be needed to power photosynthesis in the aquarium. A Gro-lux lamp might be expensive but surely it is worth the 3 cool Daylight lamps that would be needed to produce the same photosynthetic response, never mind thecosts of running those extra lamps. An added benefit of chosing a plant lamp over a commerical lamp is that these lamps have far less green and yellow light in their spectrum that would be of advantage to algae. Of course there is an aesthetic component as well: we want our tanks to look good to our eyes and this will mean supplementing with green/yellow light to get the lush green we want to see. In this respect, the Osram Natura and Skywhite have high color rendering indexes (CRIs) and would produce a pleasing look. So, here is some data on CRIs (sadly, some companies are not very forthcoming with the information). I hope this little write up has given us something to think about… To those of you thinking about building LED arrays you may want to ensure that there is a 1:9 ratio of violet-blue to orange-red in your spectra (based on the Gro-Lux lamp). I know Herve is using the Natura, perhaps he can send us some photos and tell us how well it is working for him? 1. Yorio, Neil C., et al. "Improving spinach, radish, and lettuce growth under red light-emitting diodes (LEDs) with blue light supplementation." HortScience 36.2 (2001): 380-383.
dart, Hanekka and Greystoke like this. I forgot to be very explicit: we don't claim to have identified the best or worst lamp, only a method to compare them and get a general idea of which are the better or worse lamps. Also, how much faster a plant will grow based on the choice of lamp is currently a big unknown. The plan from this point on is to do some experiments, trying different lamps over the same plants under the same conditions and then compare biomass after several weeks. When these experiments start will depend on tank space and money for lamps. Both the Aquastar and Power Glo have large 500-600 nm peaks that are not great for plants, but excellent for algae. The Aqua-Glo is probably the most interesting lamp in the mix... It has a very different spectral distribution to the Gro-lux. I am very interested to know if the difference in spectrum translates into different plant growth rate. dart and Greystoke like this. Very interesting read, thank you for all the time and effort. Extremely good story. Even if you have trouble folding your brain around some of this stuff . . . ask questions. It will help a lot. That PAR/W story was thrown-in as a desert. I new Tyrone wanted to add this in, but it's also the first time I see this . Very good thing to realize that sometimes expensive toys are very often just that: toys. ... Maybe my brain is dead this Sunday morning/afternoon. How do I ensure there is a 1:9 ratio? Is it as simple as: 1W "blue" LED and 9W "red" LED? Also, you don't happen to know where one can source LEDs that fit the requirements? I've managed to kind-of track down good LEDs, but at exorbitant prices. That's not that easily explained. You need to examine the spectrum, if it's available. Otherwise, most LEDs have - more or less - the same shape of spectrum, so it's allowed to talk about them in "general" terms. LEDs usually have a blue peak and a green/yellow/red bulge. Violet/blue is usually is limited supply, whereas green/yellow/red is most often plentiful. The ratios between the two will determine the Kelvin rating. I normally buy cheap Chinese Cool Whites for $2 a piece delivered. From what I know (and experienced) about them they are not great plant growers because they lack a lot of violet/blue, so I bought ten 420nm LEDs from Hong Kong for R99 delivered. lux is the measure of lumens per square meter..
We actually want Photon Yield Flux which we can only calculate from the lamp spectrum & the plant's response to different light wavelengths... PPFD (AKA PAR) is just a convenient measure. If you know your lamp, and you know the PPFD (or even the Lux) then you can use Greystoke's tables to calculate the Photon Yield Flux. But even with this, what really matters is the amount of red and blue light not the amount of photons that the plant can theoretically use. Reading about this commercial venture with LED lights means the know-how exists, cost on execution might be the problem. Wonder if GE will ever share the optimal LED design or if we will ever see it in SA. Looking at the pictures it looks more like a system of light periods than a single LED mounting.